Celebrated model, race car driver and horse-riding enthusiast Jodie Kidd will be leading Belmond’s first equestrian safari through Botswana this October. Samantha Strawford talks to her about her life, her passions, and the adventure ahead. From the remote Savute region, where large herds of elephants and mighty prides of lions roam, to the sprawling plains of the Okavango Delta, this exclusive journey will bring explorers up close and personal with Botswana’s wild nature. At the end of the day they’ll be treated to world-class indulgence in the luxury of Belmond’s safari lodges: Belmond Savute Elephant Lodge and Belmond Eagle Island Lodge. What are you most looking forward to about Botswana? I will celebrate my 40th birthday whilst we are in Botswana and I can’t think of anywhere I’d rather be. Nature is my ultimate passion and to be able to experience one of the greatest natural environments, on horseback before staying at Belmond’s beautiful lodges will be a dream come true. I can’t wait! I am also really looking forward to spending time with fellow travellers—the group will be small with only 15 people, so we will have time to get to know each other and share in the adventure. When did you first discover your love for horses and riding? I was practically born on a horse and could ride before I could walk. I’ve been surrounded by horses for as long as I can remember. How do you balance your passions for fashion and adrenaline-fueled challenges? I always put 100% effort into what I do and I always grab life’s opportunities—especially when it comes to travel and new experiences. I love the buzz of riding or driving fast cars, but am equally buzzing when I’m in my kitchen. Tell us about your love of food? I am now officially a landlord! I bought my first pub last year, The Half Moon Kirdford and have been busy turning it into what I hope will be is the best country gastro-pub. I am passionate and committed to supporting locally sourced suppliers and working with the best local ingredients. What advice can you give to anyone considering booking this safari experience? As Sir Winston Churchill said, ‘No hour of life is wasted that is spent in the saddle’. Book the trip, grab the opportunity and never stop pushing yourself mentally, physically and spiritually—I will be there to guide you through this exciting adventure! 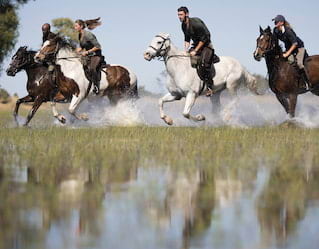 Jodie Kidd will be hosting Belmond’s first horseback-guided safari in Botswana from 25 September to 1 October 2018. Join her for this unique experience, and discover this untamed land in unforgettable style.